Automatic presses are easily operated thanks to their pneumatic systems. They feature new higher power pressing, fully adjustable, and a variety of bucks for specialist applications. 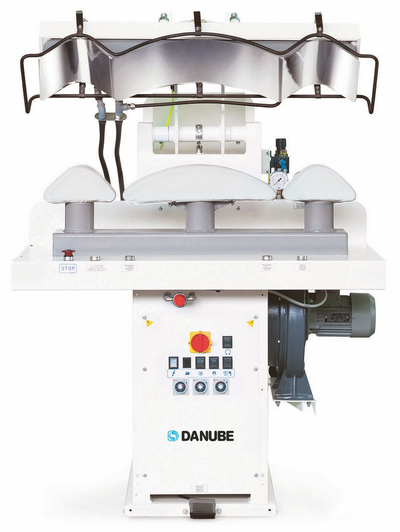 The wide opening bucks, facilitate both the pressing operation and the use of the steam iron. Operation of the press head is controlled by buttons. In this case, to ensure operator safety, a safe-hands protection frame is fitted to the press head. 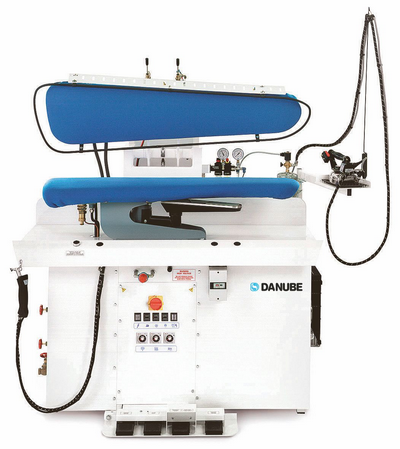 The presses are available either completely self contained with built-in electric and automatic steam boiler, vacuum and compressor unit as required, or for central supplies operation. Up steaming lower and upper board. Lowering of the upper buck controlled by two push buttons. Steam inlet in the upper buck by push button. Steam inlet in the lower buck by push pedal. Equipped with a vacuum unit. Ready to be connected to central steam and air supply. Built-in electric steam boiler 16 Litres (12 kW). Built-in air compressor 2 HP. Group of iron + pedal.